Private scenic city sightseeing walking tour. Experience historical Lucerne from the perspective of the Middle Ages, enjoy compact edutainment in small groups of not more than 10 persons. CHF 200.- package up to 10 persons (larger groups on request). Please inquire by e-mail to ralf@citytrip.ch or telephone (079 306 82 87). In summer about 90 minutes, in winter about 60 minutes / about 1.6 km. 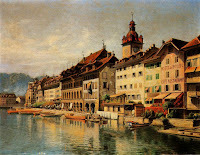 Rathausquai / Rosengartplatz, at the Kapellbrücke, right river bank or at the lobby of your Lucerne Hotel by supplement. The Tour starts at 10am or 2pm or any other time according to the agreement. Medieval Theme walk focussing on Lucerne in the Middle Ages from the 12th to the 18th century. First you hear the sound of the firehorn. Then Nightwatchman Ralf indtroduces himself and tells you about the hard life of a town servant of the lower class. On the 400 year old Martini Plan you will see the route of your tour and sights of Lucerne, which are still preserved today. 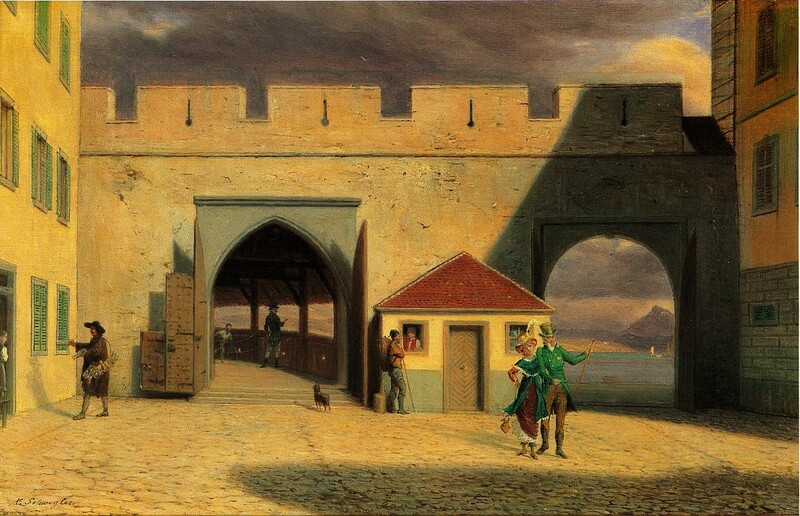 Wall and Gates on Chapel Square, 1835. Wasserturm (Water Tower), the Kapellbrücke (Chapel Bridge), the Peterskapelle (St. Peters's Chapel) and the Zur Gilgen House with Baghardsturm. 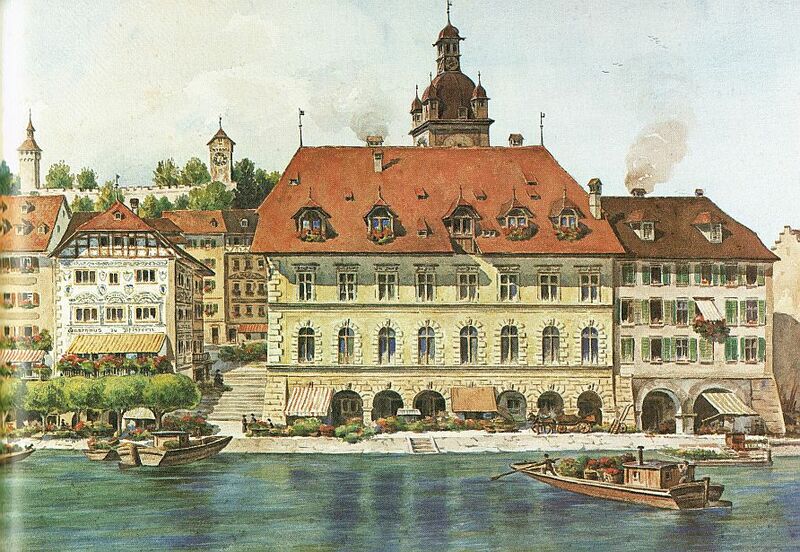 With the help of historical pictures, which were exclusively printed for you on postcards, you learn how Lucerne used to look in the Middle Ages. 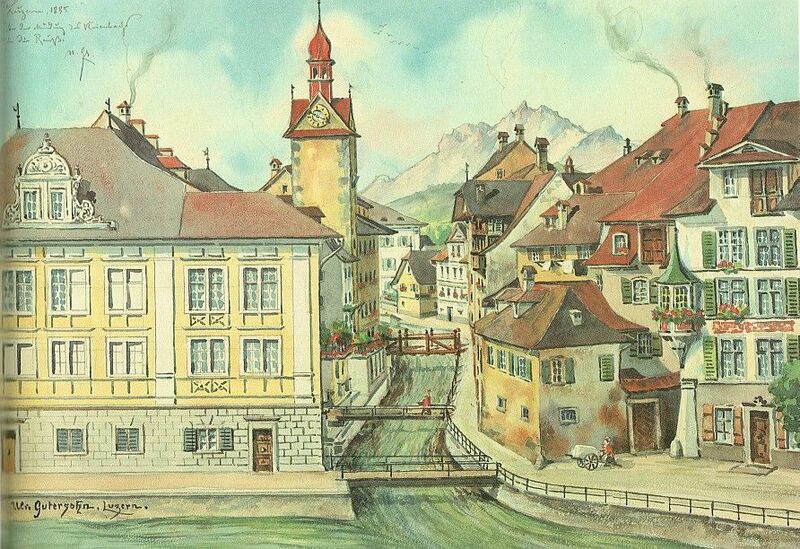 You see the Kapellbrücke (Chapel Bridge) as it looked until 1897 and the Medieval city wall at the Kapellplatz (Chapel Square) with the gates to the former Hofbrücke and the landing pier. In the Furrengasse you learn about the Ghost and the Toggelis, who were ghosting around there. 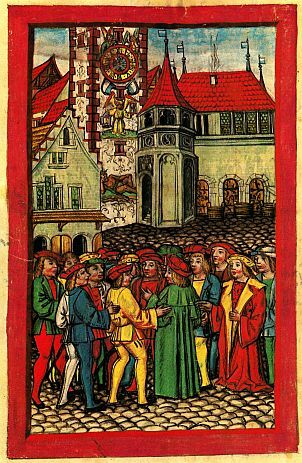 At the Kornmarkt (Town Hall square) you hear the Legend of the Giant of Reiden, who used to decorate the Town Hall Tower as a fresco. You see the tower clock, which still manages without a minute hand. At the town hall, which was built in the late Renaissance, you see the Lucerne Foot and the Lucerne Elle. In the Brandgässli (Alley of the Fire) you hear the legend of the Riot of Lucerne. At the Weinmarkt (Wine Market) you refresh yourself with the best water of Lucerne. At the lower wine market, you see the first court square in Lucerne, where a pillory was once used. You continue to the Zöpfli at the Reuss, one of the most beautiful corners of Lucerne's old town. You cross the Reussbrücke, where the Trülli once stood and you continue over the Münzplatz to the Old Suidtersche Pharmacy to see the medieval display window. You see demons at the House of the Old Suidtersche Pharmacy and on the facade of the Jesuit College. At Ritter's Palace, you hear the story of the unlucky stonemason Hans of Trient, before you look at the stonework in the interior of the building. Next you visit the seven paintings of the Dance of the Dead by Jacob von Wyl on the second floor of the building. 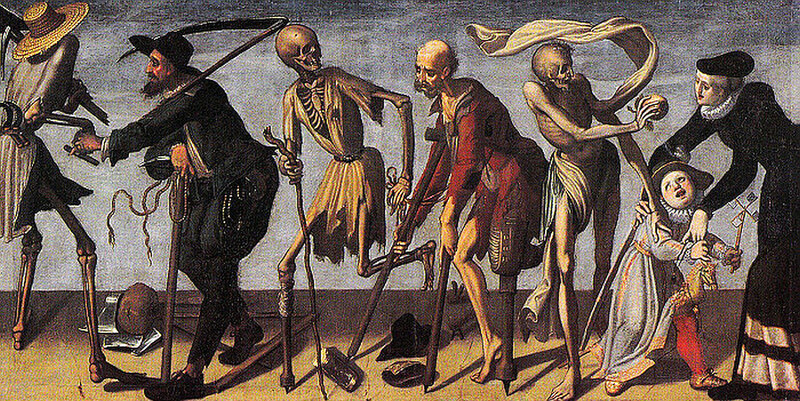 The Dance of the Dead by Jacob von Wyl, Panel 7. You continue along the Jesuit Church, the first large Barock building in Switzerland. Then you stop to see the Renaissance Town Hall on the other side of the river and you you listen to your guide's explanation about this late Renaissance building. You go on to the Kapellbrücke, where you will see the Giant of Reiden as the first picture. You will view some other pictures on the bridge before you stop to get your last postcard: A view of the right river bank, and the Town Hall. The tour ends at the end of the Chapel Bridge, at Rosengartplatz on the Rathausquai. * The Ritterscher Palace is open to the public from Monday to Friday but can be closed for visitors in case of governmental events. In this case an inside visit of the building is not possible and the presentation of the Dance of Dead paintings will be on the iPad of your guide.